Golden Virginia: Pure Salmon has been promised $20m to build its salmon farm in Tazewell County. Image: Pure Salmon. 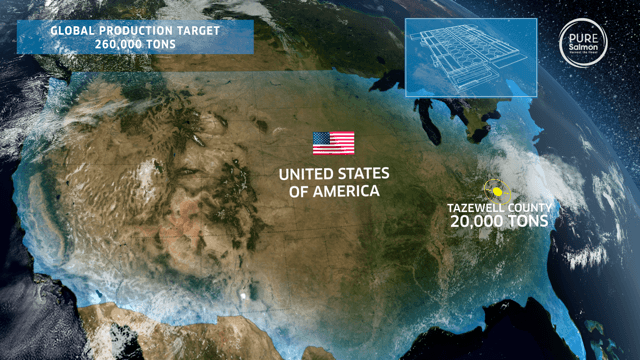 Pure Salmon, which aims to grow 260,000 tonnes of Atlantic salmon per year at on-land farms across the globe, has named Tazewell County, Virginia as the site for a 20,000-tonne facility to serve the eastern United States. It said it is getting $20 million of development assistance for the project. The company, which has an existing recirculating aquaculture plant in Poland and recently announced a 10,000-tonne RAS plant in Japan, also revealed more details about where it plans to build in Europe. 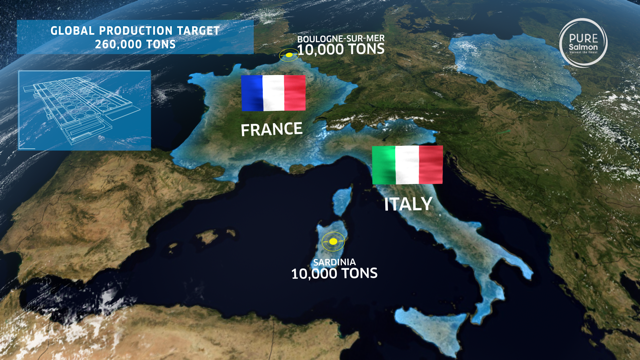 Pure Salmon will choose between Boulogne and Sardinia to site a 10,000-tonne RAS facility. Click to enlarge. Image: Pure Salmon. Two locations are being considered for a 10,000-tonne facility - the fishing port of Boulogne on the northern coast of France, and Olbia in the north of Sardinia. Pure Salmon said the Olbia project had attracted significant support at a national and local level, both politically and financially. The facilities in Poland, Japan, the US and France or Italy will comprise the first phase of Pure Salmon’s roll-out plans and contribute 40,000 tonnes of production to its global target. The facility in Poland can produce just 580 tonnes per year but is strategically important to Pure Salmon as an R&D and training centre. Pure Salmon's on-land farms will include a hatchery and a processing facility. The facilities will be identical, apart from size. Pure Salmon also intends to build five 20,000-tonne facilities in China, to target the major population centres of Beijing, Chengdu, Shanghai, Guangzhou and Shen Zen. It also plans more sites in the US and other regions. 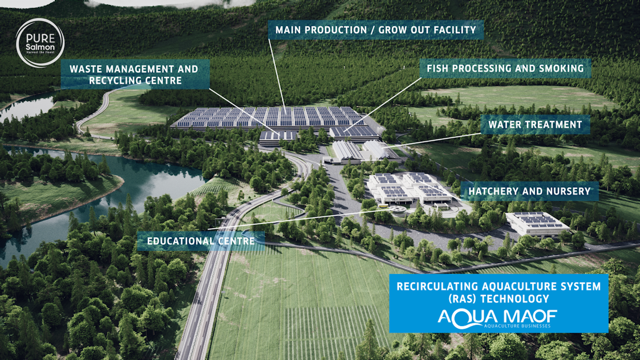 Israeli RAS expert AquaMaof is providing the technology for Pure Salmon’s facilities, which will be identical in design and will be fully integrated with on-site hatcheries, grow-out systems and processing facilities. 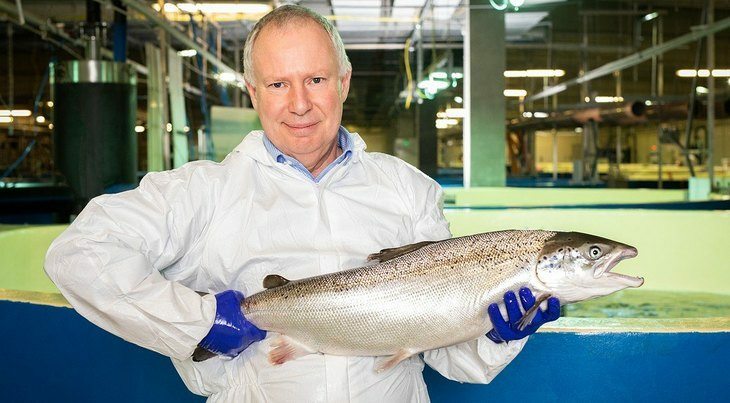 David Cahill, whose previous roles include Marine Harvest Scotland regional business manager and Huon aquaculture manager, has been recruited as Pure Salmon’s head of production. Pure Salmon has been developed by Singapore-headquartered 8F Asset Management Pte. Ltd, a global asset management firm focused on impact investing. 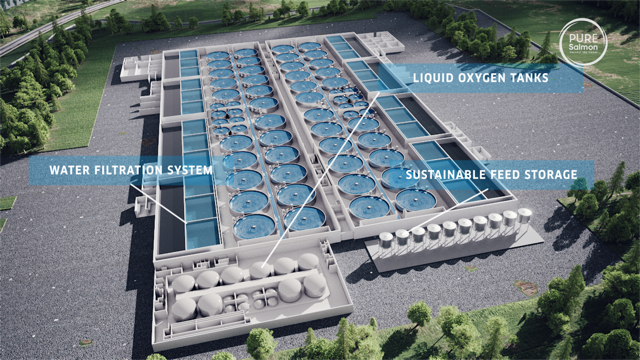 Stephane Farouze, chairman and founder of 8F, said: “We’re delighted to be announcing further details of our plans to build large-scale land-based Atlantic salmon farming facilities in the US and Europe. Can Pure Salmon change the game for RAS grow-out? A recent study for Highlands and Islands Enterprise concluded that on-land salmon farms being built around the world posed no immediate threat to the Scottish industry’s expansion hopes. Pure Salmon’s plans may prompt a re-think.